I would love to hear if you try this recipe and if you added any unique twists, leave a comment below and let me know how it turned out. 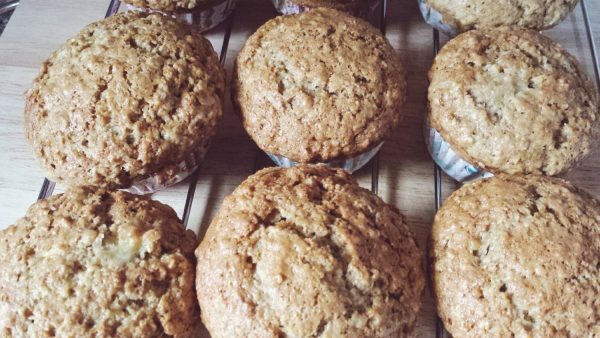 These moist, delicious muffins are a staple in our house. This is also a fabulous base recipe which you can add almost anything to. In medium bowl, stir together the flour, oatmeal, coconut sugar, baking powder, baking soda, salt, cinnamon and nutmeg. In a separate bowl, combine the mashed bananas, eggs, milk, vanilla and butter. Add the banana mixture to the flour mixture, stirring just until the dry ingredients are moistened. For adding milk, start with 1/4 cup and adjust to get a batter that is not runny, but not super thick. Spoon batter into greased muffin cups. I use paper muffin liners greased with coconut oil. Bake for 18 to 25 minutes (start watching around 15 minutes as oven temperatures vary) or until toothpick inserted into center muffin comes out clean. Let cool in pan on wire rack for 10 minutes. Remove muffins from pan and let cool on wire rack. These muffins freeze well! To freeze, allow the muffins to cool completely. Wrap in saran wrap and then store in ziploc freezer bags in your freezer. NOTE: If you are in a humid climate then I suggest storing in an airtight container in the fridge.